Urban kids provides high quality, fun, functional furniture for children of all ages. With three children of our own, we know their furniture needs to be durable, as well as safe. That's why all urban kids products, while incorporating the latest designs, meet the highest European and New Zealand safety standards. Most of our New Zealand made products are Designed by Umur Yazici. Urban Kids range of children's furniture follows a specific programme tailored to suit a growing child's tastes and needs. While focusing on comfort and a sense of belonging, you will still find it is practical and safe - all furniture is fashioned with smooth edges, countersunk bolts and gliding drawers. 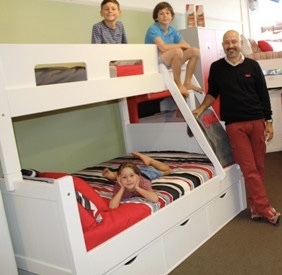 Urban kids is proud to be a New Zealand owned and operated company, providing top quality custom made New Zealand furniture.